High blood pressure, also known as hypertension, is one of the most common health conditions in the United States, affecting approximately 25 per cent of all adults, two-thirds of whom are younger than 65. The term high blood pressure simply means that people affected by this condition have higher than normal blood pressure levels as their hearts pump blood through the body`s arteries. This greater than normal force can damage the walls of the arteries, which in turn can result in dangerous deposits of harmful (LDL) cholesterol and various toxic substances. If this process is left unchecked, the end result can be heart attack, stroke, and other cardiovascular conditions. The most common symptoms of high blood pressure are breathing difficulties, dizziness, fatigue, gastrointestinal problems, headaches, insomnia, and irritability. Left unchecked, however, high blood pressure can lead to serious heart conditions, including stroke, as well as damage to the brain and kidneys. There are two types of high blood pressure, essential high blood pressure and secondary high blood pressure. Essential blood pressure is high blood pressure that occurs without an obvious cause, while secondary high blood pressure is caused by kidney damage or failure and/or imbalances in the endocrine system. The vast majority of high blood pressure cases—over 90 per cent—are essential high blood pressure. Caution: If you suffer from secondary high blood pressure, seek immediate medical attention. 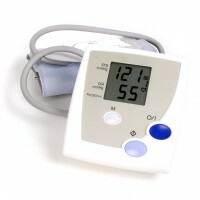 Your blood pressure levels can easily be measured using an inflatable cuff device known as a sphygmomanometer that is placed around your upper arm. Once the cuff is fully inflated, blood flow through the artery is temporarily stopped. Your doctor, listening with a stethoscope to the artery at elbow, will slowly release the pressure in the cuff. Just as the blood flow in the artery starts to resume, a pounding sound can be heard. As soon as it is heard, your blood pressure will be noted. This measurement is known as your systolic blood pressure. Next, the cuff pressure will be released further until no sound can be heard. Once again your pressure will be noted, this time indicating your diastolic blood pressure. Normal or healthy blood pressure readings range between 90 to 135 systolic over 50 to 90 diastolic, with a reading of 120/85 considered average. High blood pressure is indicated when the systolic rises above a reading of 140, and the diastolic rises above 90. For accuracy, your blood pressure should be measured on two separate occasions at least two hours apart. Note: Factors such as stress, physical exertion, and powerful emotions such as fear and anger can skew blood pressure readings. Therefore, it is recommended that you do not have your blood pressure measured during such times, but wait until you are calm and rested to ensure an accurate reading. Like many other chronic health conditions, high blood pressure is primarily due to our unhealthy modern lifestyle and diet. In indigenous cultures around the world, where a healthy, natural diet is the norm, and Western lifestyle factors do not exist, high blood pressure is virtually nonexistent. Therefore, in order to effectively prevent and reverse high blood pressure, knowing what causes it is an essential first step. The primary causes of high blood pressure are atherosclerosis (hardening of the arteries), poor diet, environmental toxins, and lifestyle factors. Various pharmaceutical drugs can also cause or worsen high blood pressure. Atherosclerosis: Not only is atherosclerosis a major cause of high blood pressure, it is also one of the primary causes of both heart attack and stroke. Atherosclerosis, or hardening of the arteries, is caused by the buildup of plaque in your body`s blood vessels, especially the arteries. In atherosclerosis, the buildup of plaque thickens the blood and hardens the arteries, making them narrow and less elastic. Combined, these symptoms of atherosclerosis create resistance to the body`s blood flow, raising blood pressure levels. Poor Diet: While high blood pressure is quite common in Western, industrialized nations, researchers have found that it hardly exists at all among native peoples in Africa, China, South America, and Micronesia. The reason for this has to do their diets, which are much healthier than today’s standard Western diet. This point is brought home even further by what happens when people from these native lands relocate to more industrialized areas and begin eating accordingly. Soon after they adopt a more Western-based diet, they too begin to show signs of high blood pressure, as well as many other chronic diseases. The primary dietary factors that can cause high blood pressure are excessive consumption of saturated animal fats and refined salt (sodium chloride), coupled with a lack of fresh fruits and vegetables, rich in magnesium, potassium, and other nutrients that are essential for healthy blood pressure levels. This is especially true of people who rely on fast foods or who regularly dine out rather than eat at home, as such meals are typically extremely high in both salt and unhealthy fats. It is a rare that prepared foods are made with unrefined sea or mountain salt and healthy oils and fats, such as coconut butter, extra virgin olive oil or organic butter. Environmental Toxins: Environmental toxins such as cadmium, mercury, and lead, can all elevate blood pressure levels. Typically, the levels of environmental toxins in people with high blood pressure are 300 to 400 per cent higher than those with normal blood pressure levels. Other common environmental toxins or pollutants have the potential to raise blood pressure levels, as well. Sources of such toxins include tap water, toxins circulating through the air we breathe, and, in the case of mercury, dental amalgam fillings, various vaccines and sadly, fish and seafood. Chemical residues and toxins remain in produce that is conventionally grown and in the flesh of animals that have been raised with chemically treated feed. Lifestyle Factors: Common lifestyle factors that can cause high blood pressure include excessive consumption of alcohol and caffeine, smoking (including regular exposure to second-hand smoke), and a sedentary lifestyle. Research has shown that both systolic and diastolic blood pressure levels rise in direct proportion to the amount of caffeine a person consumes throughout the day. As for alcohol, even moderate consumption of beer or wine can raise blood pressure levels in some people. Smoking or exposure to second-hand smoke causes high blood pressure because of how smoking damages cells and narrows arteries. In addition, cigarettes contain an abundance of life-threatening chemicals that further increase overall health risks. Even smokeless tobacco products such as chewing tobacco and snuff can raise blood pressure levels because of the nicotine and sodium they contain. Being sedentary can also contribute to high blood pressure because a lack of exercise results in poor oxygenation of the body`s cells and tissues, and can create a negative impact on the heart muscle, causing it to have to work harder to do its job. Pharmaceutical Drugs: According to the Physicians` Desk Reference, the following drugs can all cause high blood pressure as a side effect of their use: Alfenta Injection, Aredia for Injection, Dobutrex Solution Vials, Epogen for Injection, Habitrol Nicotine Transdermal System, Lupron Depot, Methergine Injection and Tablets, Orthoclone OKT3 Sterile Solution, Polygam Immune Globulin Intravenous Human, Procrit for Injection, Sandimmune, Sandimmune Soft Gelatin Capsules, Tolectin, Velban Vials, Ventolin Inhalation Aerosol and Refill, and Wellbutrin. Other Causes: In addition to the above factors, high blood pressure can also be caused by diabetes, high cholesterol, obesity, and chronic stress. Adopting a healthy diet is perhaps the most important step you can take to prevent and reverse high blood pressure. Ideally, your diet should consist of 20-25 per cent protein, 30 per cent healthy fats, and 45 to 50 per cent carbohydrates. Fish such as blue fish, cod, Greenland halibut, mackerel, and wild caught salmon are excellent sources of both protein and healthy fats. Avoid farm-raised salmon, because of the antibiotics and food dyes they contain; tuna, which is high in mercury; and shellfish, which contain a high degree of contaminants. Your intake of red meat should also be minimized, and if eating red meat, bison or lamb are preferred. Choose free range, organic poultry, preferably turkey. Keep portions small, between 4-8 oz. Excellent vegetarian options include tempeh, tofu, eggs, and soaked and cooked or soaked, sprouted and steamed beans or legumes. Also include lots of organic, fresh fruits and vegetables, as well as non-wheat complex carbohydrates, and drink plenty of pure, filtered water throughout the day. For additional benefit, also include garlic and onions and use raw virgin coconut butter/oil or extra virgin olive oil for all of your cooking needs. For salads, olive and flaxseed oils are recommended. Raw, unpasteurized dairy products in moderation are acceptable. During the cooler months a good breakfast choice is organic oatmeal, which has been shown to reduce cholesterol, blood pressure levels and to reduce the overall risk of heart disease. Optionally, cream of brown rice cereal or quinoa flakes make a delicious warm breakfast cereal. In the summer months consider smoothies, fresh fruit salad or unsweetened granola and fruit. The following nutritional supplements can all help to prevent and reverse high blood pressure: vitamin A, beta carotene, vitamin B3 (niacin), vitamin B6, vitamin C, bioflavonoids (especially rutin), vitamin E, coenzyme Q10 (CoQ10), evening primrose oil, fish oil, calcium, magnesium, potassium, selenium, and zinc. The amino acids cysteine, taurine, and tryptophan can also be helpful. Vitamin D has been shown to be a key factor in high blood pressure. Take Vitamin D3 50,000-100,000 International Units a day http:/// for periods of up to four weeks. According to the Physicians` Desk Reference, the following drugs can all cause high blood pressure as a side effect of their use: Alfenta Injection, Aredia for Injection, Dobutrex Solution Vials, Epogen for Injection, Habitrol Nicotine Transdermal System, Lupron Depot, Methergine Injection and Tablets, Orthoclone OKT3 Sterile Solution, Polygam Immune Globulin Intravenous Human, Procrit for Injection, Sandimmune, Sandimmune Soft Gelatin Capsules, Tolectin, Velban Vials, Ventolin Inhalation Aerosol and Refill, and Wellbutrin. Meditation is another form of stress management that can be highly effective in reducing high blood pressure levels. So much so, in fact, that since 1984 it has been recommended by the National Institutes of Health (NIH) over conventional blood pressure medications for cases of mild high blood pressure. Alternative Medicine Guide to Heart Disease, Stroke and High Blood Pressure, Burton, Goldberg. Choices for a Healthy Heart, Joseph C. Piscatelli. High Blood Pressure Solution; Natural Prevention and Cure with the K Factor, Richard Moore. Homeopathic Medicine and the Treatment of High Blood Pressure (Homeopathy in Thought and Action), Vinton McCabe (Kindle edition).